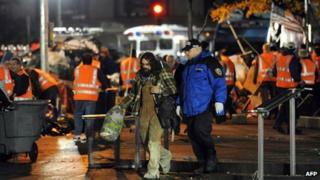 It was early in the morning on Tuesday in Lower Manhattan when New York police began the process of evicting the Occupy Wall Street protesters who had been camping at Zuccotti Park for nearly two months. They were woken up at 01:00 (06:00 GMT) and ordered to leave, before hundreds of police began dismantling tents and removing property. Leaflets were handed out saying the park had to be cleared because it had become unsanitary and hazardous. Any belongings left behind would be put into storage. Protesters were told they could return in several hours after the park had been cleaned up, but without camping equipment. The police seem to have taken the demonstrators by surprise: "I was dead asleep. Then I was like, oh man, there was cops kicking the tents and people yelling 'this is not a drill!'" Mutsukai Iroppoi, 22, told the AFP news agency. "They gave us about 20 minutes to get our things together," protester Sam Wood told Reuters news agency. "They just turned up, they didn't make any effort to communicate with us ahead of time. They rallied in secret along the waterfront, on South Street, and they just kind of rolled in with all of their equipment, dozens of lighting trucks and probably several hundred cops." The BBC's Laura Trevelyan at the scene said protesters could be seen leaving the park, dragging their belongings. There were some scuffles with police. Riot police, wearing helmets and carrying shields and batons, blocked off access to the park, which was lit up with spotlights, and police helicopters with searchlights circled over the area. The riot police... wrestled them to the ground and cuffed them. Everyone I witnessed being arrested was resisting peacefully. More people started arriving at the scene to support the protesters after they sent out a mass text message alerting followers to the raid. Another protester, Hristo Voynov, an 18-year-old student who said there were about 150 people inside the park, told the BBC that "pretty much any reputable business has at least one or two cops in front of it to make sure everything is OK; any street within two blocks of the park is being barricaded, no-one can go anywhere close by". Even though the clearance initially seemed to pass off peacefully, reports started coming in of protesters being forcibly evicted. Our correspondent says she spoke to two protesters who told her that when they refused to leave police used batons and forcibly evicted them. Another protester, who was not in the park at the time of the protest but was just outside, said police used pepper spray on him to try to disperse the crowds, our correspondent adds. Protesters, some of whom shouted angrily at police, began marching to two locations in Lower Manhattan where they planned to hold rallies. In what had become a sea of tents in the middle of the park, the protesters had set up a kitchen, a medical tent, a social media headquarters and a library. Protesters have said several hundred people had been regularly sleeping in the park. Police dismantled tents and threw them and the other belongings of protesters in skips, said US reporter Josh Harkinson, who managed to enter the area around the park that had been closed off by police. He says he saw police use a giant orange bulldozer to clear the scene. He was very close to the food tent inside the park when police moved in to arrest protesters there. Mr Harkinson says he was then hauled away by police and saw protesters being pepper sprayed and cuffed on his way out. "I just got shoved out of the park by a police officer. I'm now going to explain what I saw," he said on Twitter. "The riot police moved in with zip cuffs and tear-gassed [later corrected to pepper sprayed] the occupiers in the food tent. Then they wrestled them to the ground and cuffed them. Everyone I witnessed being arrested was resisting peacefully." Police ended up arresting some 70 protesters, including a group who chained themselves together. Protesters say they are planning to shut down Wall Street on Thursday by holding a street carnival to mark the two-month anniversary of their movement which began on 17 September.